On 26th October it was my nameday! I didn’t have any special plans, but I decided to have a new haircut. I also did a make up look to celebrate it! I wanted to create a happy look and I used this palette from Prestige Cosmetics. I used Seventeen natural velvet foundation. These are the shades I chose. 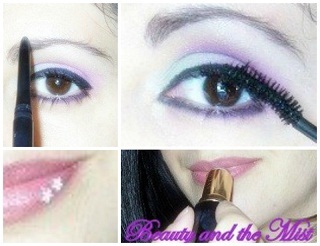 I used black and purple pencil eyeliners from Avon. On my eyelashes I put black mascara from LR and I used a soft black brow liner from Avon on my eyebrows. I fixed the shape of my lips with Avon’s mystery mauve lip liner and I continued with Frozen Rose lipstick from the same brand. I placed small, pink, plastic flowers on my face to make the result cute with a glitter gel fix! Of course I removed them before I go to do some shopping at the supermarket!